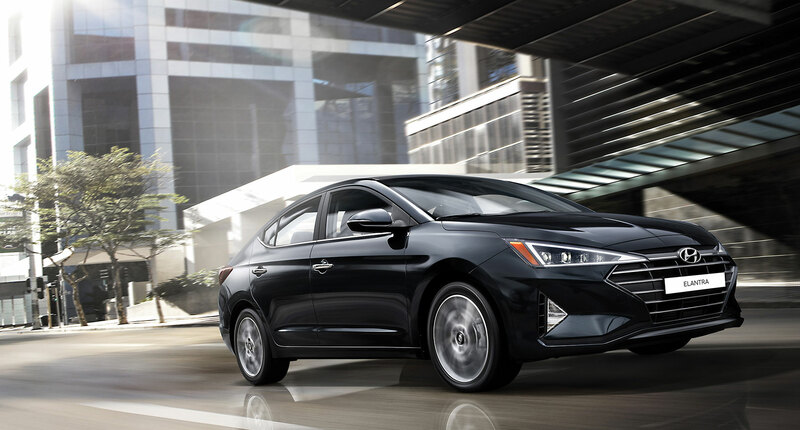 The award-winning Hyundai Elantra returns completely refreshed for 2019 as a more powerful, more luxurious, and more advanced sedan than ever before. This elegantly styled sedan has been designed with a new exterior appearance, offering a new grille and sportier stance, while still reducing aerodynamic drag for better fuel economy and reduced wind noise. Plus high-class features like LED daytime running lights fore and aft along with High-Intensity Discharge headlights give the new Elantra a distinctly upscale appearance both day and night. Smart features like a hands-free trunk and door handle approach lights will also make your Elantra experience better than many vehicles costing twice as much. Here at Penticton Hyundai we have a wide selection of brand new 2019 Hyundai Elantra models. Check out our selection of used Hyunda Elantras and other pre-owned models like the Elantra Touring. Visit our Hyundai Showroom for specifications and pricing information on all Elantra trims and models. We have one of the best selections of new and pre-owned Hyundai vehicles in the BC, Okanagan region including Kelowna and Penticton. Contact us to book a test-drive today! Along with its sophisticated exterior, the 2019 Elantra is just as luxurious on the inside. A 2.0L Atkinson four-cylinder engine is attached to your choice of a six-speed manual or automatic, both with adjustable drive modes to suit your mood. With 147 horsepower and 132 lb-ft of torque, the new Elantra zips through traffic without effort thanks to its lighter yet stronger Superstructure which also quells potholes and road imperfections for a more supple ride. Plus with mileage ratings of just 9.3L/100km city and 6.4L/100km highway, gas stations will become a distant memory. Safety was a major factor when created the 2019 Elantra, which is why it’s jam-packed with all the latest safety equipment Hyundai has to offer in even more trim levels than ever before. Active safety systems like Rear Cross-Traffic Alert, Adaptive Cruise Control, Lane Departure Warning System with Lane Keeping Assistance, and even Autonomous Emergency Braking with Pedestrian Detection help keep you (and those around you) safe. It’s one of the many steps Hyundai has taken to ensure it remains one of the safest vehicles to drive on the market. The 2019 Elantra has a beautiful interior, offering a more intuitive control scheme and high-quality materials to make it look and feel like a vehicle costing twice its price tag. Standard heated front seats along with optional heated rear seats and even a heated steering wheel ensure you’re always comfortable. Plus, your choice between a large 7-inch touchscreen or massive 8-inch touchscreen ensure that all the Elantra’s control fall easily to hand. Plus Bluetooth, Apple CarPlay, and Android Auto compatibility mean that you can keep connected to your smartphone—even while on the move. Visit Penticton Hyundai’s Parts Department to see our full selection of Hyundai Elantra parts and accessories. Everything we carry is OEM certified to ensure the fit and finish of your vehicle is perfectly matched. Regardless if you’re looking for professional installation or service repairs, look no further than our Service Department. Our qualified mechanics will ensure that your Elantra leaves in top condition.